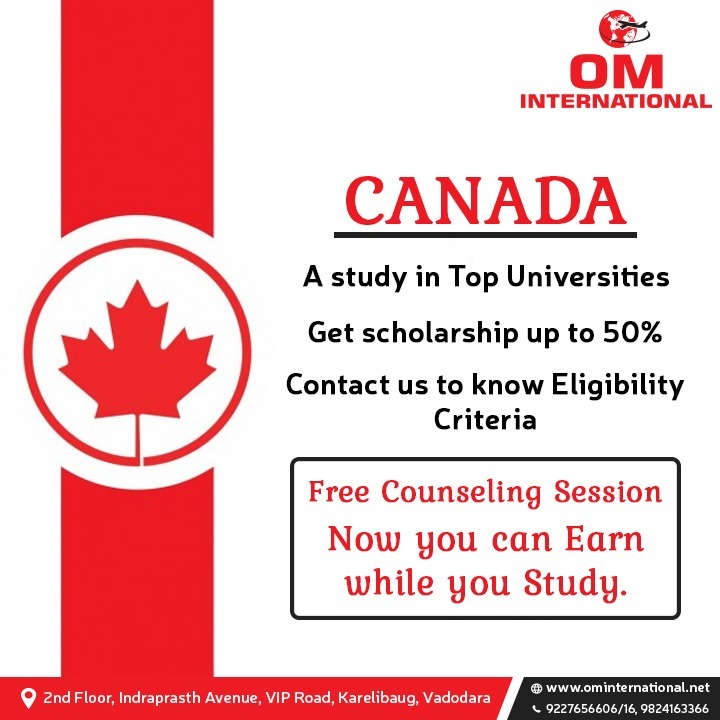 OM VISA Consultancy - Global Immigration, Students, Visitor, Business & Work VISA Consultants: A Study in Top Universities in Canada, Contact us to know Eligibility Criteria & Free Counselling by OM INTERNATIONAL...!!! A Study in Top Universities in Canada, Contact us to know Eligibility Criteria & Free Counselling by OM INTERNATIONAL...!!! OM INTERNATIONAL consultancy is a company that offers guidance in the fields concerning studying abroad, migrating overseas, settling abroad, working abroad and investing overseas. We provide customized services to our clients to guarantee that they have an easy time when moving to a whole new country. OM INTERNATIONAL Career Consultant objective has not only been to ensure that our esteemed clients find the best universities when they go abroad to study, to be able to establish businesses in the foreign country or to get employment overseas but also to see to it that they are satisfied with our services, settle conveniently. And above all maintain a good relationship with them. As a result, many who have chosen OM INTERNATIONAL services over the years have testified to have had the best transition into the foreign country for the different purposes they were undertaking. Students prefer to study abroad in search of a broad spectrum of features they intend to be thorough with. Education Abroad helps them to become more professional with hands-on practice and experiences to make a successful career. Selecting Canada as a foreign destination for education and training in the best Alma Maters provide the required skills and knowledge for the student to make effective progress in a career for brighter future. Canadian Universities are ranked as top universities globally and the ranks remain stable. Universities of Canada focus on application-based learning. It includes case studies, field research and real-life application rather than reading the theory. The Alma Maters in Canada adopt latest technologies in classrooms and make use of robotic technologies and cloud computing too. Professors make use of the online portals. It consists of lecture notes, home works, questions & answers. Online portals help the students and professors to make their work easy. Students submit their assignments and home works through online portal making less use of the paper. The parents also are given access to online portals to know the day-to-day activities and progress of their beloved son/daughter. Most of the universities prefer English and very few universities encourage French as well. The CLB through IELTS generally will be 6.0 and language of communication with most of the population will be English, which makes student life more accessible and easier. This is one of the reasons students were asked to undergo training before attempting IELTS. This way they can acquaint themselves better with different accents of English language. During the course of study, the college or university provides the student to take up a teaching assistant or Research assistant job within the department. The application process for this job differs from each university. In this position, the student spends at least 12 hours in a week as a lab instructor or lecturing the students about the topics of their study which acquaints the student more with the subject in short period time. Mostly the teaching assistant is regarded as a part of graduate student’s degree requirements. This is one amazing feature that the Alma maters in Canada provide. 1. Student Accommodation: The students that choose to Study in Canada live in dormitories, rent-an-apartment, rent-a-townhouse/suits, or homestay. Many houses that own near the universities offer a room to students, which cover the meal sometimes at an affordable price. Students share accommodation with other students which saves them big time. 2. Student Visa & Scholarships: The Student Visa Process is comparatively made easy than a process to other countries because the application process works better for Indian students with Student Partner Program. Non-governmental and university-specific scholarships are granted for Foreign Students in Canada. Most of the Alma Maters in Canada make this facility available for International Students. 3. Affordable Cost: Canadian Universities are publicly funded and therefore offer the quality education with low tuition fees while maintaining best academic standards. That’s why the cost of education in Canada is less expensive for any specialization offered at Canadian institutions compared to other countries. 4. Best country to study abroad and live: Canada is ranked as a 4th best country to live in considering the quality of life. The factors such as standards of living, literacy percentage, safety, political stability, and low to no pollution contribute to its 4th rank. Canada focuses on potential and value of people over religion, caste, creed which makes the students, to undoubtedly step into the nation to Live and Study. The students studied in Canada were offered with PR under certain visa categories with the intention of the government to hold back the potential workforce who contribute to the strong economy. For more details call OM INTERNATIONAL, Best Abroad Education Consultant in India to make an appointment with trained and updated counselors to work with your Student Visa process for the admission into Best University of your dream course in May 2019.